I'm currently working on memorizing Philippians four, and this verse just popped out at me the other day when I was again working on the chapter. Stand fast. Stand fast. Stand fast. IN THE LORD. We live in a time and an age when there isn't a whole lot of standing anymore. You can look just about anywhere, no matter what your "circles" are, and you will see people who are falling. Left and right. The ones who are still standing stick out because they are few and far between. Even our modern day "heroes of the faith" are falling. I could go into a list but it wouldn't be helpful and besides you all l know exactly who I am talking about. Everyone from the leaders in the most liberal Christian circles, to the leaders in the most conservative Christian circles. The last couple of years have shown even those of us who thought these people were perfect...that they are just as normal and prone to falling as anyone. I really believe that the falling happens when we get sidetracked and start focusing on an agenda. A program. An organization. A formula. People start focusing on these things instead of Jesus Christ, and then we wonder why they fall. It can be so easy to look at "Christian" culture around us and wonder if anyone will continue to stand. It can get discouraging. You can think that you are all by yourself, and that no one else is with you in standing up for whatever it is that God has called YOU to stand for. I just want to encourage you today with a few thoughts. Some of them are still fresh on my mind from a sermon I heard the other night that greatly convicted my heart. *Don't walk around in defeat, assuming the worst. Listen, the battle has already been won. The end of the story is already written. Our part is to continue to do the RIGHT thing, to continue fighting, to continue standing. And not just to do it because we "have to", but to do it with JOY! With victory! With assurance of the truth of our cause! *Don't be discouraged because you think you are the only one standing. Because first of all, you aren't. There are way more people on God's side than you could imagine. Yes, lots of times it seems like Christians are almost extinct. But never forget that all over the world, there are still pockets of people who have chosen to stand and fight. You might not know them, but they still exist. This world is so much bigger than we think. The church is diverse and spread, but there is still a strong remnant and you are not the only one! *Don't forget your purpose and your joy. So often we get caught up in all of the depressing things going on around us. We sit around talking about how everything is falling apart and there is no hope for the world. That is completely contrary to what God tells us to do. He didn't say "Therefore, my brethren dearly beloved and longed for, my joy and crown, so sit in defeat and fear and talk about how bad things are getting." Not at all! Quite the contrary. 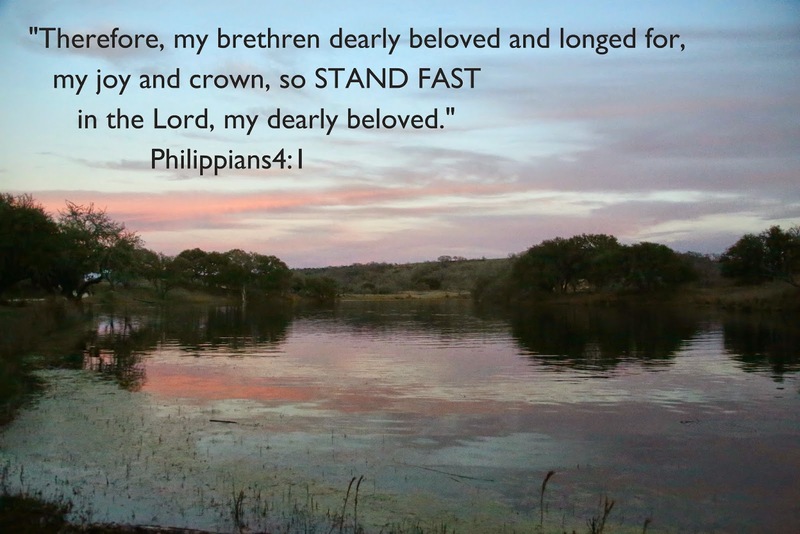 He told us to "stand fast in the Lord". Do the right thing. Live for Jesus. Be bold. Be passionate. Remember that you are not living and working for simply A cause, you are living and working and standing for THE Cause. I close encouraging you to visit this link and listen to this very powerful song that I believe will challenge + stir your heart to continue standing for the truth. I LOVE listening to it on my way to work! My husband and I were recently talking about how easy, and destructive, it can be for believers to put Christian leaders on a pedestal. We get so caught up in their eloquent speech, outward spiritual maturity, and self-confidence that it can become tempting to mesh their words and interpretation of scripture with scripture itself. We know several individuals who've found themselves committed to following an individual rather than Christ. Above all else, it is essential that we stand fast and firm in Christ, rather than placing our trust in men who are just as sinful as we are! I'm enjoying these posts, Chelsy! So true that the victory has already been won!! Love that promise! Thanks for the encouraging post, Chelsy! Just last Sunday a young man at my church preached a really good sermon on "Standing"! :-) It's really an interesting subject, and it's neat that you posted about that just now! 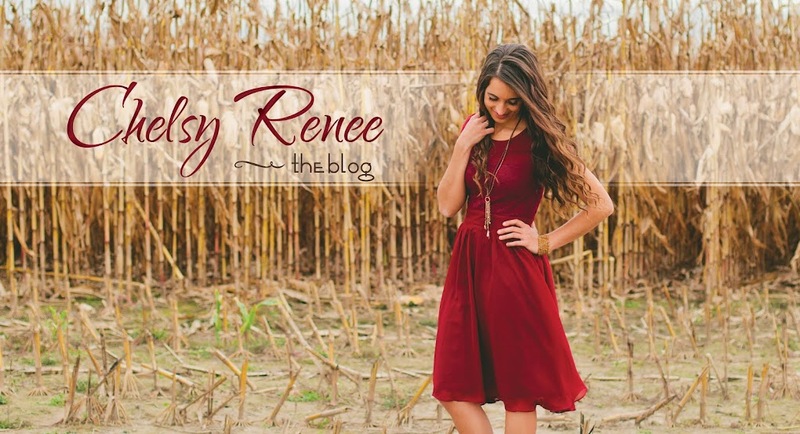 When studying the word Stand, I thought is was really neat all the different things that we are told to stand in... here are a couple of things I wrote down that I thought you might enjoy: we're told to Stand in grace (Rom. 5:2), stand in the gospel (1Cor.15:1), stand fast in the faith (1Cor.16:13), stand fast in the liberty (Gal.5:1), stand against the whiles of the devil (Eph.6:11-14), stand fast in one spirit (Phil1:27), stand perfect in the will of God (Col.4:12) and of course stand fast in the Lord! Well, any way, thanks for sharing! You are an encouragement to me to stand fast in the Lord, and not to loose courage! Thank you! Thank you, thank you, thank you so much for sharing!!! It is so true. We shouldn't be putting our trust in men who fail, but rather in Christ who never fails!!! Btw Chelsy, is you/your family attending the Big Sandy ATI conference this year? Would you prayerfully consider going to the Sacramento one too?!! Yes, we did attend the Big Sandy conference-it was a super last minute decision as we weren't originally planning to go. The Sacramento one is a little far, and we have a pretty full summer already, so I don't think we will be going anywhere else. Amen---thank you for this encouragement!